Fighting games aren't for the faint-hearted. There's no relaxation or light entertainment in the breakneck world of kill-or-be-killed beat 'em ups. Long before home consoles and internet connections, these kind of games fostered serious competitive scenes around arcade cabinets. The term eSports is now common parlance, and yet the biggest fighting game franchises are struggling, only really appealing to their loyal fanbases. But for the developers behind these titles, it's a catch-22. 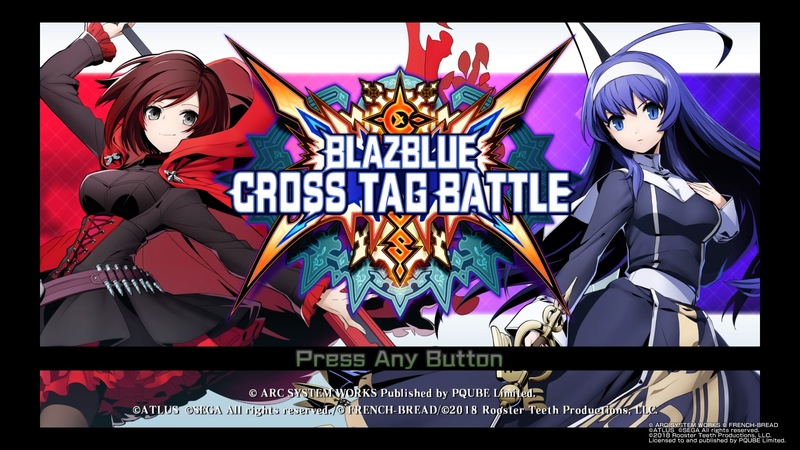 It's after playing BlazBlue: Cross Tag Battle -- which has only recently come to the PC, PS4 and Switch in Europe -- that I'm reminded why. Fighting games can be extremely rewarding, but only as a result of being fundamentally difficult and alienating to begin with. BlazBlue isn't nearly as storied as franchises like Street Fighter or Tekken, but after BlazBlue: Calamity Trigger was first released in late 2008, there have been four direct sequels, numerous updated versions and several spin-off titles. Visually, BlazBlue is most like the Guilty Gear series (also developed by Arc System Works) in that it's a 2D fighter with an anime art style. This allows for practically limitless creative license. There are countless quirky attacks, ridiculous projectiles that materialize out of thin air and special finishing moves that defy physics, rhyme and reason. The character roster includes classic anime heroes with spiky hair and oversized weapons, samurai robots and plenty of schoolgirl types wielding blades and guns. Like every good rock-paper-scissors fighting game, there are characters with long-range, keep-away projectiles, grapplers with powerful throws and fast-fisted brawlers that can overwhelm opponents with constant pressure. In short, there's a fighter for every style or strategy, and many that lie somewhere in between the spectrum extremes. 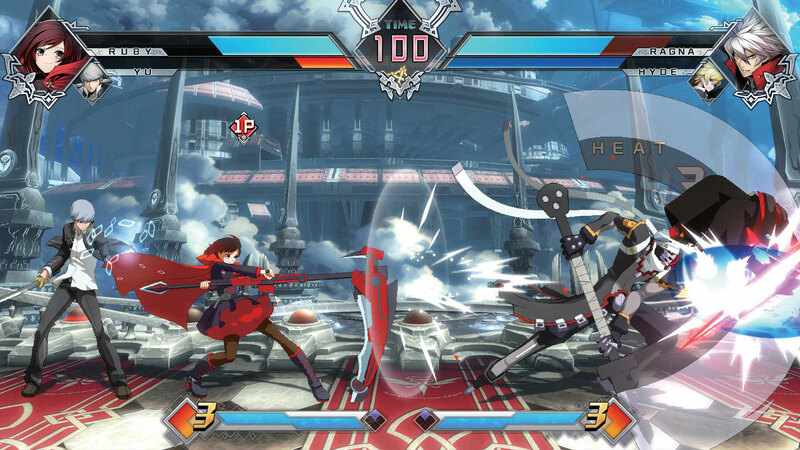 BlazBlue: Cross Tag Battle is different from previous entries in the series, being the first to feature two-on-two battles as opposed to standard head-to-head duels. You always have a lead character, and one that hides off-screen, slowly recovering health while waiting to be called upon. Much of the game's complexity, then, comes from using the assist moves of your resting character and extending combos by switching fighters on the fly. Many fighting games use similar mechanics, of course, such as the Marvel vs. Capcom series famed for its frantic, team-orientated battles. Though there's an appropriately silly story mode designed to introduce you to the various fighters -- characters from BlazBlue, Persona 4 Arena, Under Night In-Birth and Rooster Teeth's RWBY anime series -- the meat and potatoes of BlazBlue: Cross Tag Battle, naturally, is going mano a mano with other players online. But that means learning the game first. To actually be good at a fighting game, you need to spend countless hours practicing combos to embed them into your muscle memory, so they can be performed without much forethought. You basically need to learn the ins and out of every character, partner assist and playstyle. Everything is situational. 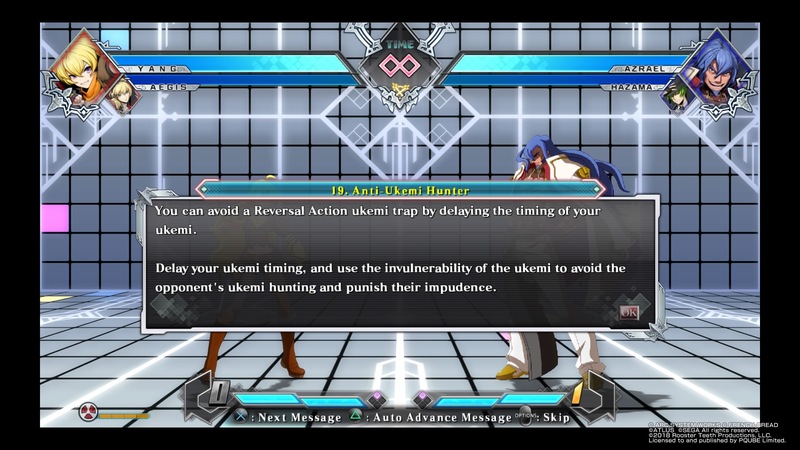 In an effort to help new players reach some level of competence, all fighting games these days ship with training features. In Cross Tag Battle, the tutorial element is called "Tactics Mode." It starts off fairly basic, explaining movement, blocking and different types of attacks before moving on to assists, recoveries, escapes and special moves. The "Practical Application" lessons take you through more advanced mechanics, such as fighting with both characters simultaneously, special skills that reset momentum when you're under pressure, and the extra tools at your disposal when you're down to just one fighter. These all rely on different gauges or conditions, so there's a lot to process. Much is taught without context, too. Yes, I can press two buttons while blocking, but when I should be burning resources to perform an invincible escape is anyone's guess. Tactics Mode will also take you through all the characters to give you an idea of their playstyles, special moves and bread-and-butter combos. Then there are missions -- pre-programmed scenarios -- that let you practice mechanics in a match-like setting. The problem with these is they already assume "Reject Guards" are part of your everyday lexicon and you're already familiar with a character's invulnerable anti-air moves. Google and YouTube are your friends here, of course, but this is where I find most fighting games fall down. They don't soften the learning curve for new players. These are the mechanics, here are a couple of combos; now go work the rest out against a dummy in training mode. Perhaps with a better focus on tutorial features, new players wouldn't run into a wall so quickly. I have a basic knowledge of fighting games that translates between franchises. I'm talking positioning, special move inputs, that sort of thing. So after spending as much time as I could bear in the tutorials, I have dabbled online. And this is where the magic of fighting games presents itself. I've been demolished many times, but have also experienced a few close games where I've come out on top. There's nothing in competitive gaming that's quite as satisfying as taking a match in a split second with a clutch air dash and well-timed super. 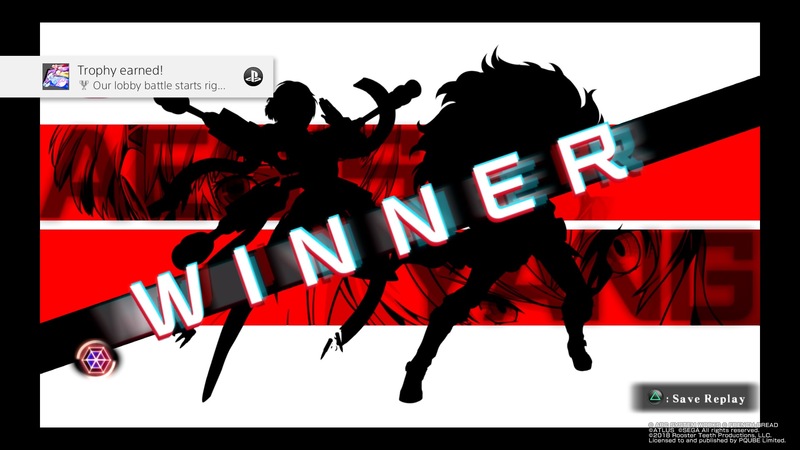 That's what fighting games offer: A euphoric moment of intense gratification. I actually won a game?! But there's only so long you can spend spamming the same combos and basic techniques before you get bored of your own limited understanding. And that's the point at where many players simply give up, because getting better at fighting games is most people's definition of hell, not fun. There are plenty of genres of competitive games where progression is fun. Take shooters as an example. You can quite happily jump into a match and pop some heads, and there's a cross-section of players that will revisit that experience without needing anything more from the game. But with the hours you invest, your aim gets a little better, you begin to learn the layout of the maps and devise strategies to improve your odds of winning. Fighting games are different in that respect. Simply playing isn't really enough to improve. If anything, getting beaten over and over can become demoralizing and put you off altogether. This is particularly true of the lightning-fast pace of BlazBlue: Cross Tag Battle, where the screen is constantly filled with projectiles and seizure-inducing animations -- it's a confusing assault on the senses. Back to training mode it is then, but that's where the real grind starts. Between practice sessions, you need to head to online forums to read up on strategies, advanced combos and dreaded frame data (how long specific move animations last, which serve as a guide to the risk/reward profile of each attack and tell you when you can punish, say, a blocked combo). Winning might be extremely rewarding, but absorbing the information you need to win at a high level is not. Only when you know practically everything do you actually start playing the game. Fighting games are similar to poker in that sense. Once you've mastered it, the cards on the table or the characters on screen are just the scenery -- at that point, you're playing the person sitting across from you. It becomes a war of minds and resolve, not pushing buttons. Fighting games just aren't made for casual players, and simplifying things doesn't help anyone. Many top players have complained about the simplicity of Street Fighter V, and how lowering the skill cap for the benefit of new players has impacted the pro scene for the worse. Street Fighter III: 3rd Strike and Street Fighter IV have parry and "Focus Attack" mechanics, respectively, that skilled players use to turn defense into offense. Street Fighter V has no direct equivalent. Cross Tag Battle is supposed to be a simpler BlazBlue, too, as technically there are only two attack buttons, with three others reserved for special attacks and partner plays. In my opinion, though, the game is anything but simple. New players may have fewer buttons to mash to perform basic combos, but there are still many mechanics I barely understand that a skilled players can pull out to turn a bout in their favor. The fact fighting games aren't suited to casual players, as well as more serious gamers that don't want to spend their evenings practicing the same combo over and over, is manifesting in poor sales. As of March 31st this year, Street Fighter V has sold just 2.1 million units in total, while Marvel vs. Capcom: Infinite sits around the 1 million mark. A severe lack of interest in the latter has led to the decision not to incorporate the game into the Capcom Pro Tour event circuit. Bandai Namco is faring a little better. At last count in March, 2.8 million gamers have purchased Tekken 7 and 2.5 million have picked up Dragon Ball FighterZ. The active playerbases of all these games are much smaller, though. In the past month, just over 2,500 people had played Street Fighter V through Steam, while 3,700 had jumped into Tekken 7. 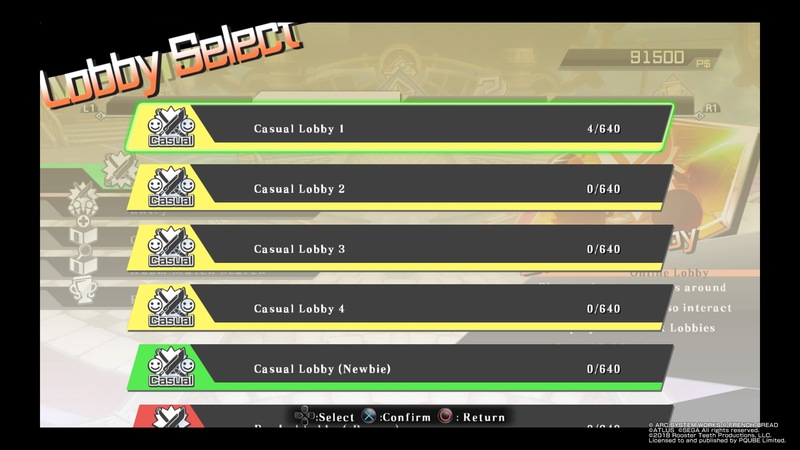 Playing BlazBlue: Cross Tag Battle on PS4, I've seen as many as around 45 people in online lobbies, and as few as 4. At the time of writing, 21 million people were playing Fortnite. 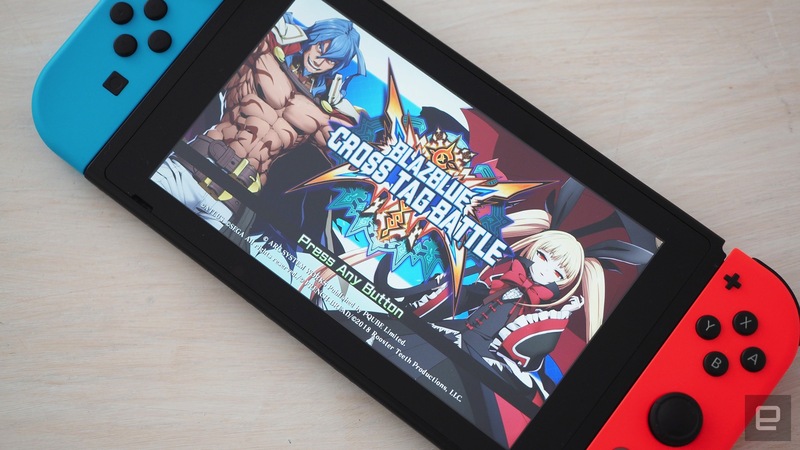 Low sales figures have forced fighting game developers to squeeze the playerbase for revenue, mostly in the form of additional, purchasable characters. BlazBlue: Cross Tag Battle is treading a similar path. The game itself is $50 with a 20-strong roster, but to ensure you get the 20 DLC characters as they're released, you have to purchase a $20 add-on. Some individual characters are free, while three-fighter packs and extra color sets are $5 and $2, respectively. That's quite the investment for a competitive game that has less than 50 people playing at any one time (on PS4 at least). I don't know what fighting games like Cross Tag Battle can do to stretch beyond their current niche into more mainstream multiplayer circles. Perhaps they will always be king of the Tokyo arcade, but overlooked on consoles. There's definitely scope to make the getting better part more fun and interactive, rather than a lonely grind spamming combos against a static dummy. The majority of learning at the higher levels takes place outside the game, too, in forums and on specialist sites. Could the answer be building that community within the game itself? At least the competitive scene remains fiercely loyal to the genre, and making these kind of games progressively simpler is not an option. They need to be hard or victories wouldn't be nearly as sweet, defeats nearly as agonizing. And as a spectator, the high skill cap is fundamental to the intensity of matches. Without that, you wouldn't create legends like Daigo Umehara and Justin Wong, or moments like the iconic full Chun-Li super parry at Evo 2004.